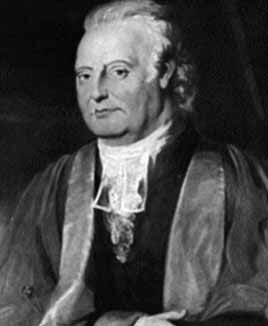 Edward Waring (1736–1798) was one of the leading British mathematicians of the eighteenth century. Originally from Shropshire, he studied in Cambridge where he was Senior Wrangler in 1757 and later became Lucasian Professor of Mathematics. Other holders of this post included Newton, Babbage, Stokes, Dirac and Hawking. Waring worked on algebraic equations, infinite series, interpolation and conic sections, but his most notable results were in number theory. Edward Waring (1736–1798). Image: MacTutor History of Mathematics archive. In 1770, Waring announced a conjecture about the representation of the natural numbers. He investigated how any number can be expressed as a sum of powers. He claimed that every number is a sum of 4 (or fewer) squares, a sum of 9 cubes, of 19 fourth powers, “and so on”. This implies that, for any power , there is some finite number such that every number is a sum of no more than -th powers. We let denote the smallest number of -th powers sufficient to represent every number. Since any number equals a single first power, namely the number itself, . Waring claimed that , , , “and so on”, although he gave no formula for values of when . Moreover, he gave no proof of his claims. Later the same year, Lagrange proved the Four-Square Theorem: any natural number can be represented as the sum of four perfect squares (we include the possiblity of zero components in the sum). The four-square theorem states that . When we consider the number 7, the representation is and no fewer than four squares suffice. In fact, no number of the form can be expressed as a sum of three squares. This was clarified in 1798, when Legendre showed that three squares suffice for all numbers except those of the form . This is Legendre’s Three-Square Theorem. Proofs of the Four-Square Theorem are given in many textbooks (e.g., Hardy & Wright). We just note a few key points. Euler showed that if two numbers are each expressed as sums of four squares, then their product is also a sum of four squares (this is also related to the modulus of the product of two quaternions). Thus, it is enough to consider prime numbers. Primes are of two forms, and . Those of the form can be expressed as sums of two squares. Those of the form can not. But four squares always suffice for the latter. This result for the primes was stated earlier by Fermat, but without proof. When , the numbers 23 and 239 require 9 cubes, but no larger number requires more than 8. Hardy and Wright use the notation to represent the number of -th powers that suffice for all numbers but for a finite set of exceptions. In some sense, is more fundamental than . The four-square problem appeared long before Waring’s day, in the Arithmetica of Diophantus who lived around 250 AD. Waring’s Problem for general powers was finally proved by Hilbert in 1909 and is now known as the Hilbert-Waring Theorem. Hilbert’s proof led on to major developments in number theory. Although Hilbert proved that is finite for all , he did not provide an explicit formula, and research continues on this question. Every positive number n is the sum of k components each being a k-gonal number. … and so on … . although there is no record of this! The general result, for all polygonal numbers, was proved by Cauchy in 1813. Hardy, G. H. and E. M. Wright: An Introduction to Number Theory. Oxford Univ. Press, (1938). Fourth Edn. (1960) 421pp.